I added the missing photoshoots from this year to our gallery so make sure to check out the photos. Holland looks stunning in all of them! We have new themes on main site and gallery! Hope you like them as much as I do! Also we have added thousands of new photos of Holland in our gallery. Enjoy! First BTS photo from Teen Wolf season 6! Hurray! Someone posted very first behind the scene (bts) picture from Teen Wolf season 6 set! 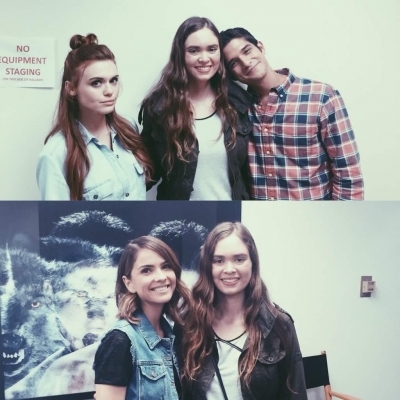 On the picture, you can see Holland and Tyler Posey with a fan! They all looks lovely, aren’t they ? I have added a few high quality photos of Holland at the premiere of “She’s Funny That Way” yesterday to the gallery, how gorgeous does she look? Holland’s been wearing a lot of red lately and we think it’s definitely her colour! Over 50 high quality photos of Holland at the recent Hollywood premiere of the new film “American Ultra” have been added to our gallery. To view them, click on the thumbnails below.